Tandem Tipper Drivers for immediate start. Must have white card, smart phone and PPE gear. Good long term work with as many hours as you want.. Good rate of pay for good drivers. Job Type: Casual If you are interested, Please APPLY NOW! 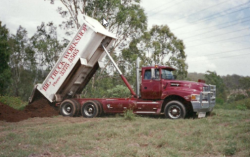 We are a demolition company servicing, Brisbane Surrounds, Ipswich & Sunshine Coast. The role includes hooking up trailor to truck. Being loaded and driving to and from Job to the landfill.